Beef Broccoli Stir Fry couldn’t get any easier. Made with strips of flank steak, which has been marinated for 30 minutes. 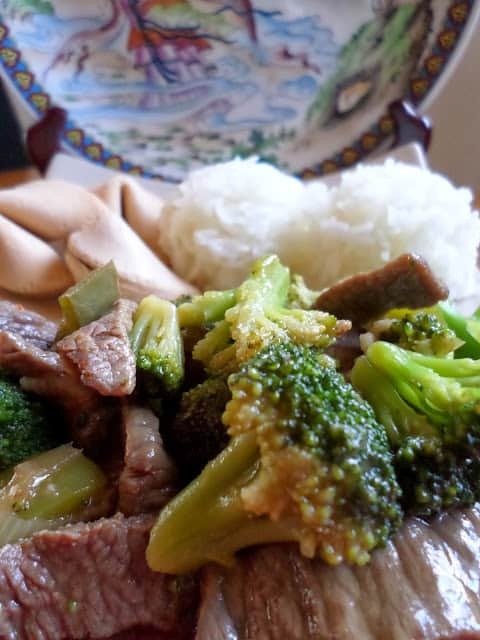 Green pepper, green onions, garlic and broccoli are combined with the flank steak and stir fry in a hot wok. A delicious sauce is made with oyster sauce, red wine, soy sauce and beef broth. 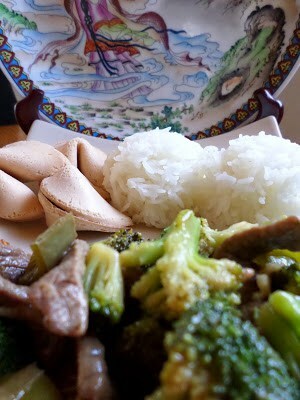 Serve beef broccoli stir fry over jasmine rice or sticky rice. Stir Fry is any dish of food that has been prepared by the stir fry method. Stir Fry basically means to quickly fry bite-size pieces of food in a large pan over very high heat while constantly and briskly stirring the food. This cooking cooking technique, which is associated with Asian cooking and the wok. Rice is an ancient grain that has been cultivated since at least 5000 B.C. Today rice is staple for almost half the world’s population, particularly in  China,  India,  Japan, and Asia. Rice is grown in one of two ways. Aquatic rice (paddy-grown) and Hill-grown rice. Aquatic rice is cultivated in flooded fields and Hill-grown rice can be grown on almost any tropical or subtropical terrain. The major rice-growing states in the  United States are Arkansas, California, Carolinas, Louisiana, Mississippi, Missouri and Texas. Start by marinating the beef; mix together cornstarch mixture, soy sauce, rice wine or water, salt and pepper in a bowl, add the sliced beef and stir to coat the slices. Let stand for 30 minutes while you prepare the sauce and blanch the broccoli. Make sauce by mixing the oyster sauce, rice wine or water, soy sauce and chicken broth in a small bowl. Set aside. Place broccoli in salted boiling water for 2 minutes, remove the broccoli from the boiling water with a large Chinese wire mesh skimmer/strainer and immediately submerge the broccoli into a large bowl filled with ice cubes and cold water. Submerge for 10 seconds. Remove the broccoli with wire mesh skimmer/strainer from the cold water, drain well and set aside. Heat a large frying pan or wok over high heat until a bead of water sizzles and instantly evaporates upon contact, add oil and swirl to coat pan or wok. Add bell pepper strips, cook for a few minutes. Remove and set aside. Heat pan again and add meat slices, let the beef fry for 1 minute. Flip the beef strips over and add the garlic, sliced green onion, if using, reserved bell pepper strips and fry for 30 seconds to 1 minute. Pour in sauce, add broccoli and bring to a boil. Pour in dissolved cornstarch in water and cook stirring until sauce boils and thickens, about 30 seconds. 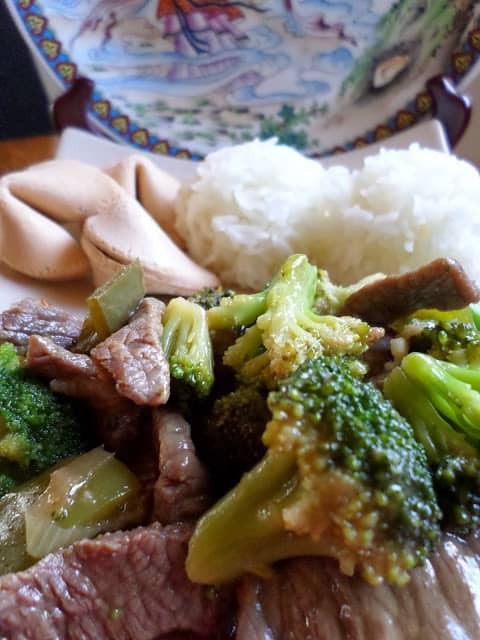 Served this wonderful Beef and Broccoli Stir Fry over Jasmine Rice. Pork Chow Mein and Chop Suey American Style are two recipes you and your family will flip over. This recipe is made using Lee Kum Kee sauces. Oh man! that sounds so perfect!!!! Gotta make it! I love this dish. This is a perfect pick with the Chinese New Year coming up this week. Yum! yum! Wow, I can't imagine -45 degree temperatures here in Florida! People here are getting nervous about the dusting of snow we are supposed to get this week. My husband would love this recipe! It is a favorite for him at Chinese restaurants. Great pick! This is one of my favourite dishes…looks perfect! Great SRC pick! I love a good stirfy and this one looks SO good. YUM! Great choice for the SRC! Looks easy AND delicious … my two favorite ingredients 😉 Great SRC choice! This looks so good and healthy! Perfect reveal pick for January!! Happy SRC day to you. Yum! I love making Chinese food at home because it doesn't seem QUITE as bad for you…. this sounds delish! My family are major fans of beef and broccoli. We have it all the time. What a great pick, happy SRC day! Your recipe turned out beautiful!! Good to be back in the SRC swing, isn't it? Hi Sally, I took a few days off during the holidays and I feel like I'm finally getting caught up now! Also one of my choices for Chinese, as well as Almond Guy Ding. I know you love sharing as much as I do Mrs Lynn, however could you keep the cold there instead of sending it up my way all the time. It seems like we have been bouncing Blizzards & Wind Chills back & forth to each other this winter.. got my Sour Dough Starter & need some help to get going, please ? Love making take away dishes at home – lovely pick!